If you ever have reason to remove vaseline from hair--rubbing cornstarch on the affected areas works great. I know this from experience. Don't shampoo first, though that would be the logical choice, it only turns the vasoline into non-removable paste. Cornstarch seems like an unlikely candidate, and you may doubt my advice as you scour the vasoline covered hair, but trust me. It's brilliant. For vasoline covered ears, ear canals, etc--probably should proceed with much caution and not use the aforementioned solution. Vasoline removal from walls, toiletry items that have gone down the laundry chute, and clothing? Haven't figured that out. I think he's out to ruin me. It's become a Tuesday night tradition copied from a friend. One parent and one child leave the house. A few dollars in their pocket as spending money and a few hours to spend together. We usually end up at a venue that sells ice cream. One week it was the half price bookstore, another the secondhand game store. Last week, it was my eldest and I who ventured out. We had big plans of picking out a Christmas present and then having ice cream. When we got out of the car at the store, I instinctively reached for his hand. We walked hand in hand into the store. It wasn't until we were inside that I realized his hand was still in mine. We were browsing when he let go of my hand to reach for a book. His action drew my attention to how old he looked. It seems like only a few days ago I was teaching our baby to clap his pudgy hands. Are those same hands now too old to hold? I waited; wondering if he would reach for me. I watched him as he scanned the cover of a book. He devoured the words and turned to me. As he mentioned that it seemed like a good choice for a friend, he took my hand in his. Seth told me it won't be long before my oldest son won't reach for my hand as we walk into the ice cream shop. "Enjoy it while it lasts," he said. It began with a simple question. "What Christmas ornaments do you guys want to make this year? I was thinking about felt Christmas trees. You guys could sew buttons on them." Felt and hot glue, the definition of crafty simplicity. The response from Eli, "Well, I don't want to do a tree, can I do Wolverine?" Ever eager to see enthusiasm in the kids; I agree. He kicks it up a notch, "Well, can we put stuffing in them?" I agree, kind of wondering where he's leading me. As I nod, mulling over what I've agreed to, I get squeals of delight from the three who have been listening to our conversation. "I want Peter from Narnia!" "I want Shortcake!" From four felt Christmas trees to four handmade rag doll/action heroes. Only around here. It's been six days since we started...still sewing. The first week after a holiday is hard at home. The whole crew undergoes a day or two of detox. Goodies, Grandparents, and less structure tends to produce craziness around our house. Starting back to school after a break is painful. The kids and I struggled Thursday. Maybe it was the weather--cold rain for a day is depressing for anyone. Maybe it was the after Thanksgiving slump. Whatever the reason, I found myself wishing I could drop two of the children off...somewhere. The eldest and youngest were giving me the hardest time. Between five little spirits any one could be having a hard day. Usually the youngest (he's two after all) is the thorn in my side. He can be a terror. He was on Thursday. His oldest brother came in a close second. After much reasoning, discussion, and an added grammar lesson (to show him what "a lot" of work really looked like), he got off to a wonderful start on Friday. It's a two year old puppy. Sitting in the dog crate. Happily panting. A short while later he's missing again. This time Ella alarmed me by yelling, "Jojo has (what sounded like) SHOT!" I only half paid attention, knowing we don't have any needles around the house. After yelling again, I realized she was saying 'salt'. Brilliant. Dinner prep seemed a little easier than usual. No toddler clinging to my leg, begging for food...drink...Bob the Builder...it wasn't until I turned away from the stove that I noticed what he had been up to. Congratulations, Ryan and Carly! I hope you enjoy this very cool t-shirt. I should have posted this picture earlier--to make a donation to the Laughner's adoption and get a shirt, go visit their blog. Updates from Tom's trip to Ethiopia (happening right now) are also posted. I love a nice comfy t-shirt as much as the next gal. 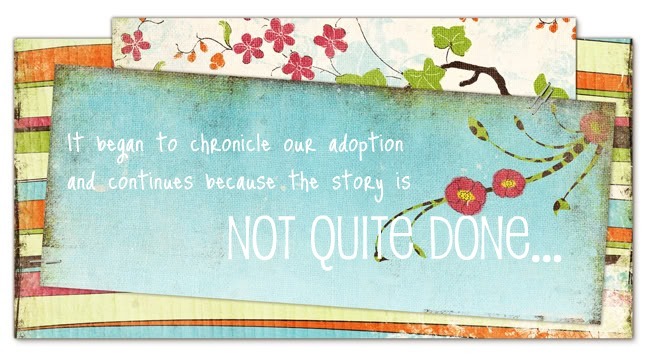 I want to support my friends who are adopting again. 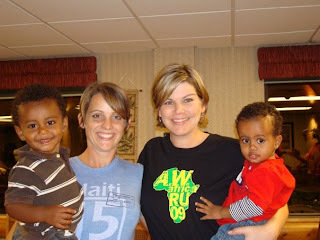 Or my friends who are in Ethiopia right now with Children's Hopechest. So, without much thought I want to buy one of their fundraising shirts. But one body can only wear so many shirts between laundry loads, you know? I have a pretty good assortment of lovely, memorable t-shirts. I don't think I need another. So, here's the beautiful thing--I'm supporting my buddies and giving the t-shirt away to you. If there are any of you out there. Leave me a comment, I'll have my (previously pictured) lovely assistant draw a name. In celebration of the admirable thing being done by the group in Ethiopia right now, I'm giving away one of the Laughner's t-shirts. You leave me the comment, on Friday we'll let you know who won. Tom and Lori will give you the size of your choice and mail directly to you. Sounds fab--I get to support my friends and you get to win a cool shirt. No worries if you aren't the winner, plenty of shirts available. Go visit the Laughner's blog and buy one! Today, Sally donned "Yellow Jumbo" for the very last time. It's a huge relief to all of us that this day has come. Every morning I feel like we step back in time as I tighten her "corset". This brace has been with us since last summer. She was on medication, newly home from Ethiopia, and much, much smaller. This day has been long overdue. I wonder if her sillies will diminish now that oxygen can get to her brain. Sally's new doctor wants her to wear this brace for another year. He was amazed at the 'fantastic work' and doesn't want her to get hurt on his watch. I'm more than happy to keep her safely strapped into the thing (obviously strapped around her torso, not her head). Her biggest grievance? She wants to wear blue jeans. Amber to receive the Bottomly's book. Enjoy! I've been thinking about doing this again...keep watching for another post. We have seen the swine flu and survived. Never before has the entire family been sick. Never before have we used so much ibuprofen (2 bottles of liquid and 1 bottle of chewables). Never before have I allowed so many videos in our home. We set up camp in the basement and hardly left for the week. Nightly, a small, hot child would creep downstairs and climb into our bed. The nights were plagued with coughing and medicine. The days were plagued with Disney and whining. We are finally well, but exhausted. I've been meaning to post about some great books for months. Books were once a passion. Reading for pleasure...a long lost love. I re-discovered that love momentarily this summer while I was living off my parents and being irresponsible. Sitting up late at night, knowing I would pay the price in the morning, but unable to close the book. I read scads of great kid's books, but rarely do I sneak off at night to finish them. I read a few chapters, then promptly close the book and tell my kids how great it will be to read a bit more tomorrow. Last spring Jill sent me her book list. That girl, she's a reader. Just like I used to be, four kids ago! I used Mother's Day as a reason to get nearly all of the books she listed. I read the first on the trip to Connecticut with Ella. 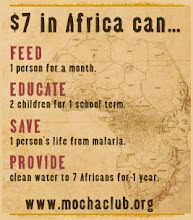 I remember sitting, reading about African orphans, in the airport. Being transported to the slums of Kenya and then looking up, across the aisle at a very well-to-do woman and wondering what was reality. An enthralling, convicting book. As with most convicting books--I push away the conviction. We have FIVE children, people! What more can one family do? Move to Kenya? Run a missions organization? Okay, some fantastic, amazing, incredible families do that. Us, we just need to survive. I've said it before here, I know that we should do something, but what? I digress...so, I'm on the airplane reading this book. And I'm completely with the author as she struggles to find out where she's supposed to be and what she should be doing. I won't ruin it by telling you, BUT she figures it out, she's doing this amazing thing, and in the last few pages she starts dishing it out to the reader. But remember--my hands are tied, big family...handful of kids. She writes (and I'm paraphrasing because Seth has since stolen the book), 'What's keeping you from doing something?' And she goes on to list a few things that might keep an average person from dropping everything and making a huge life change. Being the CEO of a company, for example. OR "A mother of five children." WHAT?! I about fell into the aisle. My tried and true excuse, "Mom to five, sorry, I've got big obligations at home." That gal saw right through me and called me out. What are the chances? Why not three kids or six, or even twelve? That was back in March sometime. Evidently, I was terribly troubled for a while but have since returned to 'normal'. No thanks to the other books I read over the summer. It's Not Okay With Me by Janine Maxwell--The one that socked me in the stomach. Same Kind of Different as Me This was loaned to me by my Mom. After I loaned it to Seth (after he took a few weeks to read the previous book), he told me, "Stop giving me books that make me cry on the plane. It's embarrassing." Hope Lives This is a study book, and I'm ashamed to say I haven't made it through the entire book. I could just race through like some gal I know, but I want to actually ANSWER the questions as I'm going through. I'm having a hard time with the answers so I decided to close it until further notice. Any of Tom Davis' books--I haven't read them all, but I've heard wonderful things about all of them. Father to the Fatherless: The Charles Mulli Story Jill loaned this book to me last year. It's an amazing story. There is No Me Without You--Can't have a book list without listing this one, because it's an Ethiopian adoptive parent must-read. And I didn't own my own copy until the Mother's Day book buying extravaganza. From Ashes to Africa by The Bottomlys--I didn't pay much attention when I was buying this, but how weird to discover that I was adopting at the same time as them. Read their blog, actually. This book would be great for famlies who are just starting their adoption, or exploring the idea of adopting from Ethiopia. So, since I'm not in that category, as a reward for reading this far into the post--I'll give it to one of you. Leave me a comment and I'll have my youngest child draw the winner next Tuesday. My very first giveaway. Nearing 300 posts, I probably should have been giving you guys my used stuff for the past three years. Just put that back in my purse. Was it just last year? ...I shouldn't pose next to Jill. ...this picture looks vaguely familiar. When I'm not blogging, I'm doing very important things. Like unpacking boxes and painting. Trying to find school books that I ordered and packed up. There are about 342 boxes in my basement labeled "homeschool". The other half are labeled "kid's books". Why wasn't I smart enough to label them more precisely? Oh, yeah, I was frantic. Frantic has been my life for the past few weeks. I've put all other household needs on the back burner as I am scraping together gumption to finish our schoolroom and find our materials. It is nearly mid-September. I'm waiting for one of the neighbors to call the police, "The lady next door says she's homeschooling, but her kids are playing outside ALL DAY LONG. There are a lot of them, you'll probably need back-up." It all came together today. I took it easy and we did some crafty things. Tomorrow, math books will be cracked and spelling placement tests will be taken. For today, drawing on the new chalk wall is very important. I was most thrilled to just sit and enjoy these five for the first time in what seems like weeks. Homeschooling--it forces you to sit still and spend time with your children. What a beautiful thing. to the AWAA Africa reunion in Branson. I would liken it to (and forgive me if this is lame, I'm running on fumes) watching years of reality tv and then spending a weekend with the cast. Doubtful that Seth felt the same way I did. He's not given to dramatics. How do you meet people that you have shared years of your life with, but never chatted over a cup of coffee? It's "Give me a hug--so good to really meet you!" over and over again. Walking away and feeling like you met a long lost friend and movie star at the same time. Weird. And wonderful. The weekend was a welcome respite from the trenches of moving. Since there are pictures from the weekend on all of the other blogs...Here are a few from the eyes of Everett (using his new birthday present--which his sister dropped from 5 feet up and broke, but he doesn't know that yet...) You may notice that the froggy ride was a hit with the big kids (this was only their second ride, by the end of the day they were doing "big stuff"). Josiah wanted to ride this thing, but wasn't pleased once the frog started jumping. In the photo above you can see him screaming and the attendant taking notice. Shortly after we were removed from the ride. Poor baby spent the rest of the day eating and riding the stroller. Lots of pictures just like this--we stayed at the same hotel as the Steiger's, Laughner's, Schmidts, and Martin's. One night we took over their breakfast area and had dinner and ice cream. Our enormous clan got more than a few strange looks. Amidst the madness that comes along with a move and 10 day trip, our eldest turned nine. He was not deprived, because he celebrated three times. We are spending a week with grandparents, great-grandparents, aunts, uncles, and cousins. Then, driving a few hours to Branson to spend the weekend meeting friends we've known for a while but never 'met'. Hope to see you there! I spent an afternoon coercing my mom to admit defeat in the potty training realm. I'm sure that the next administration will fund research to use dirty diapers to make clean fuel. Thus, keeping Sir Pudginess in diapers is actually doing an environmental service. Second only to potty training is the Bike Riding Without Training Wheels Challenge. When my mother sees a grandchild on training wheels she takes it personally. No matter their age nor experience. I thought I had her convinced by saying, "Ella's neurologist said she CAN'T ride a bike without training wheels. She might have a seizure. And Sally just got that big bike, she doesn't even know how to stop yet." No grandchild of hers will pedal with training wheels. I came outside one afternoon to be greeted by two girls careening down the driveway. Legs and arms akimbo, smashing into the gravel, and laughing the entire time. It took the three of them a week to master the balancing. Ella needed a mere afternoon to get the art of stopping and starting. Alas, Sally rides like a speed demon but is unable to stop herself. Her favored stopping method is aiming into the crowd of onlookers. They are softer than pavement. I jest, but this is a feat for both girls. Ella's prosthetic and little hand are on her left side. She favors that side and leans to the right to pedal and steer. I used her epilepsy as an excuse to keep the training wheels on, but I really wanted to save her the heartache of crashing over and over again. Then being defeated because of her differences. I'm so glad I was wrong. The simplicity of the gospel is beautiful. Unfortunately, the gospel of Jesus Christ has become corrupted in our country. "Christians" have ruined Christianity. I have pictures in my mind of televangelists who claim Christ as their Lord, but live their lives in a way that they discredit the gospel for which He died. Ella doesn't know about money grubbers who are perverting the gospel to their advantage. She knows Jesus loves her. She talks to God at night. She watches her family and learns that we live a certain way because we want to please our Lord. In her literal world, this was it. A few weeks ago, we began memorizing scripture as a family. Our first verse was, "For all have sinned and come short of the glory of God. Romans 3:23" She memorized and repeated it with clarity. I explained each day what the verse was saying. Each one of us has done something wrong. We cannot be in the presence of God because we aren't perfect. So simple. The next verse gives us the good news. "For the wages of sin is death; but the gift of God is eternal life through Jesus Christ our Lord. Romans 6:23" Without intending to, I was methodically explaining salvation to my daughter. I didn't intend to lead her down that road. As a rule, there is no pressure in our family. We read the Bible, pray, and try to live our lives to His glory. We don't shove Christ at our children. It needs to be something they hear and desire on their own. We don't ever want them to feel like they have to choose the gospel because, "Mommy told me to." Imagine my surprise when I was tucking our kids in one night and Ella began crying. She said she was crying about heaven and Jesus. I wasn't sure if she was being sincere. She is seven--she was tired and possibly trying to stall. I was unwilling to get into a big discussion with her late at night. We prayed together and told Jesus we love Him. That was all. The next day we continued our discussion. I was using analogies and getting flustered. Finally, I wanted to admit that she really wasn't able to understand Christ's sacrifice for her. She was upset, so I felt like pacifying her was not right. The gospel is simple...childlike faith. Why am I getting in the way of this being simple? I didn't care if she chose to walk away, but I felt like it was ME that was keeping her from getting a clear understanding. So I nixed the analogies and asking her what she thought. Then, I drew a picture of two hearts on a sticky note. One heart was hers and the other was Christ's. I explained that to be in heaven with God you have to have a heart like Jesus--clean and perfect. Then I showed her heart, starting clean and perfect but then drew a spot for a lie. Another spot for hitting, another for cheating, another for disobeying. Ella started crying. So I quickly gave her the rest--the second half of Romans 6:23 'but the gift of God is eternal life through Jesus Christ our Lord.' God loved Ella so much he sent his son, Jesus, to live a perfect life. Then, Jesus said I'll take your heart and give you mine. I'll take the punishment (for the wages of sin is death) for you, Ella. Romans 5:8 (our next verse to memorize) says that "while we were yet sinners, Christ died for us." At this point, she reached out and grabbed the clean heart I was holding and said, "I want that. I want Jesus to take my dirty heart and give me his." The beautiful simplicity of the gospel. My daughter, raised up seeing the gospel, but never knowing it. Believing that talking to God at night would secure her a place in heaven. Believing that she is good enough to spend eternity with God. And a mom who didn't think she was capable of understanding the simple truth. This would be my daughter after I gave up two days of my life braiding yarn into her hair. I heard rave reviews about yarn extensions. I heard bad reviews. I thought she would *love* to have long hair for a while. That won me over. We visited the variety store and bought some funky yarn. That may have been a bad choice, since funky yarn produces funky lock-like braids. She loves her yarn-ey head. The endless braiding was traumatic enough to keep us from doing this on a regular basis. The payoff has come in seeing her flip her 'locks' around throughout the day AND the daily hair regime is on hold. We moisturize and that's it. Just for fun, here are the pictures chronicling the experience. I watched a video on Youtube to get instructions, but it was really pretty easy. I could spend months listing off all of the bothersome incidents that happen with five children. Add two more children and a week of teaching Vacation Bible School...it's a recipe for disaster. Someone is always tired and cranky (probably me). Something is spilling on a clean surface. Someone is hitting, stealing, or lying and needs a reprimand. The offended party needs a hug. It goes on and on. I don't know how the idea evolved. Maybe it was the bag of water balloons that has been sitting on the counter. Maybe one of the children said they were bored. I do know that by the end of a long week we needed to get some revenge. We decided to make an obstacle course. Not just an average, pansy obstacle course. This one has an added twist. The kids compete and we pelt them with water balloons and spray them with hoses. I only wish we would have cooked this up earlier in the week when my fourteen year old cousin was in town. We could have sat in the shade while he assembled the madness. Instead, we grunted for an hour in the hot sun to get everything into place. So far: kiddos-1, adults-0. Did my grandma throw that water bomb? Our boys just did something impressive. They competed in their first triathlon. I was sick with nerves the night before. I knew that we would pull into the aquatic center parking lot and be met by children who have spent their summer training to slaughter my innocent-never-before-done-a-tri boys. Four days before the race, we did a dry run--swimming small circles in the backyard pool, biking to the end of the driveway and back, then dropping the bike and running like the wind. I knew we wouldn't be prepared. I knew other kids would be wearing speedos and triathlete shoes. I kept having flashbacks to the Mutton' Bustin' chap-wearing buckaroos that competed against the kids in the rodeo. So I started freaking out about the preparations after getting everyone to bed. It didn't help that my mother is frenzy-prone like me. We both frantically ran around putting air into tires, gathering helmets, goggles, shoes, clothes, towels, snacks... The accoutrements needed for swim/bike/run could be one good reason to stick with running alone. Shoes? Check. All the while, Seth is trying to calm us down. I think he said, "It's not like they are going to die or something." What?! Is that a possibility? Because I wasn't planning on that. Let's just cancel the whole thing and sleep in. As prepared as we could be, the morning comes. It's early and we are running late. As usual. It seems frantic with kids and equipment everywhere. Soon enough it was time for Eli to get into the pool. Now, Seth's frantic because he's the "transition guy" and he doesn't know what he's supposed to do. Run after Eli into the bike area or just let him go? Dry off his feet or just let him go? What are the professional's parents doing right now? Both boys tried incredibly hard and did amazingly well. They beat the speedos off of some kids! When we got the race results, we asked Eli if he wanted to do another one. He shrugged his shoulders and said, "Nah, it's going to take me a while to recover." It's going to take his dad a while, too. We checked the times and Eli only missed third place by four seconds. Probably the amount of time it took to dry off his feet. Josiah was getting ready to take a bath and had an accident. He looked up at me and said, "Peepee." When my mom heard him she saw a challenge--potty train the 22 month old before he moves. Today, Josiah is running around without a diaper, drinking obscene amounts of juice, and racing to the potty every 30 minutes. So far little to no success with making it to the potty. I fall into the category of moms who wait until their little boys are nearing three years old before potty training. Maybe I'm lazy or a quitter, because the messes on the floor today made me see failure. As a result, I pulled out the big guns and promised a treat if he actually goes IN the potty. A candid conversation between the two of us followed. "Josiah, lets try not to go on the floor. Mommy will give you a treat if you go in the potty. Peepee in the potty. Where do you need to pee?" His reply was astoundingly clear, "In the grass." I'd almost settle for that. Snot, Vomit, and Maggots...Oh My! The kids have gone fishing in the evening with my dad. We've worked in the garden and visited the parks for an afternoon walk. We picked strawberries and visited the historical working farm. It's been great. Except for the chaos that follows us everywhere we go. Chickens escaping from the coop and the madness required to catch them and return them to safety. The 'puppy' catching rodents, birds, and even fish. By far our worst day was when we woke up to the guinea pig laying rather still in his cage. That ended with a shoebox burial. Then my nephew and Sally shut themselves into our newly purchased refrigerator. It was in the barn, waiting for the new house (we close at the end of August). It took the two of them only a few minutes to discover the "great hiding place" and shut themselves in. Thankfully, my nephew pushed the freezer door open and then let Sally out of the fridge. Seth immediately strapped the doors shut. Then scoured the rest of the area for other death traps and firmly warned the kids that they are NOT allowed in the barn without an adult. It was terrifying. It was also just after lunchtime and the day had much more in store for us. That evening, my dog tried to drown my sister's dog in the pond. My sister had to jump in and pull our long legged water dog off of her drowning, short legged bulldog. Neither of the dogs would look at each other for the rest of the day. That day alone was exhausting. Our family is a swirling tornado of madness and if you get too close...we'll pull you into the storm. It comes in waves. We have calm times and times where wacky things happen. Those wacky things are included in the title, but I won't expound on all of them. ....Like the morning Josiah grabbed a game piece from the princess game Ella was playing and shoved it into his mouth. In one foul swoop Sally poked her finger into his mouth and jammed the piece down his windpipe so that he started choking. Thankfully, he gagged enough that the game piece came out--as he vomited.